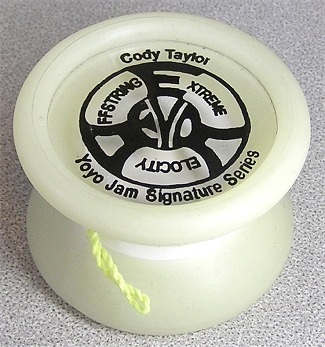 The Evo was a very short lived offstring yo-yo from YoYoJam. The body was a very soft rubberized plastic, with the latest Double Yo-Ring response system. The letters in EVO stood for Extreme Velocity Offstring. This signature model of Cody Taylor was discontinued after the first run in favor of other Offstring models.